The Surrey Heathland Partnership has been looking after beautiful lowland heathland sites for over 25 years. We work with a wide range of partners, clients and parish councils to manage the valuable heaths principally across the west of the county and into the southeast of England. What services does the Surrey Heathland Partnership offer? Lowland heathland is an open landscape generally covered in heathers, gorse and tree scrub. It can also include bracken, acid grassland, bogs, bare sandy or peaty ground, scattered trees and water. In Surrey there are two main heathland types: the Thames Basin heaths in the north west of the county and the Wealden Greensand heaths in the south west and centre. Additionally there is some heathland overlying the chalk of the North Downs. 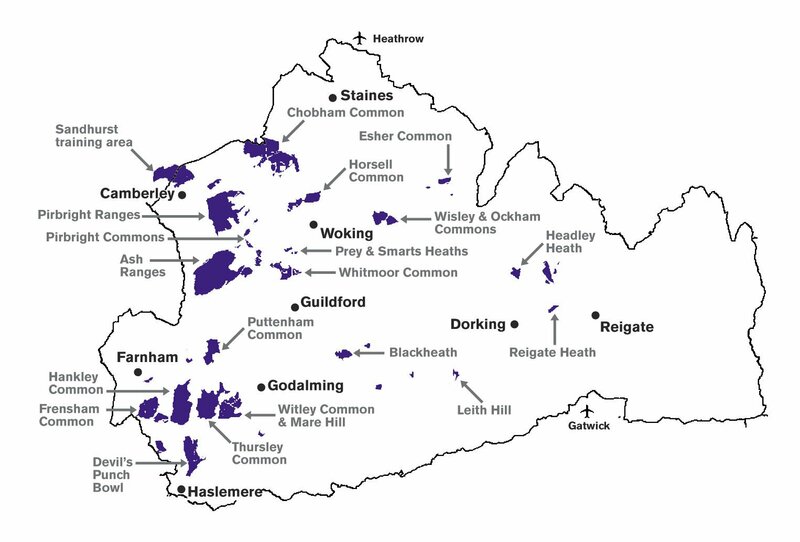 To see the distribution of heathland areas across the county, click on the map, where heathland areas are marked in purple and major sites are named. Why is it important to maintain the rare heathland habitat? Two hundred years ago heathland covered most of West Surrey but now less than a fifth of this original heathland remains. It's been mainly lost due to urban development, unmanaged forestry encroachment and general neglect. Lowland heathland is an internationally rare and unique habitat, supporting a variety of specialised plants and wildlife. In Surrey 85% of the heathland has been lost in just 200 years, leading to a severe loss of biodiversity. In recent decades heathland has been recognised for its wildlife value and its historical and cultural interest, and much is now protected from development. Although the number of characteristic heathland species is small, our heathland supports internationally important numbers of three ground-nesting bird species - the nightjar, woodlark and Dartford warbler. Lowland heathland in Surrey is extremely important for invertebrates, especially insects and spiders, and many rare and characteristic species occur. Surrey is one of only three counties in the British Isles which support all of the native heathland reptiles and amphibians, including the rare and specially protected sand lizard, smooth snake and Natterjack toad. Find out more about the targeted management work we do and why, about protecting and enhancing rare species and much more in our Surrey Heathland Partnership overview of Surrey's heathland (PDF). As with all open areas of the countryside, there is a risk of fire breaking out and there is a constant need to educate people in fire awareness and prevention. Firefighters from Surrey Fire and Rescue Service attend large numbers of heath fires each year, especially when there has been long spells of hot dry summer weather, so we all need to be careful and vigilant in this respect. The Surrey Heathland Partnership does not run a weekly volunteer task programme like the other two Surrey Countryside Partnerships, but can sometimes offer bespoke volunteering sessions for larger groups (10+) by special arrangement in the partnership area, principally during the autumn/winter scrub clearance season. Please send any enquiries initially by email to: countrysidepartnershipsteam@surreycc.gov.uk. Our Surrey Heathland Partnership countryside management service is core funded by Surrey County Council (host authority) and three borough councils: Guildford BC, Waverley BC and Woking BC.